(Bloomberg) -- General Mills Inc. rose to the highest in a year in U.S. trading after raising its profit forecast for the fiscal year and saying sales at its Blue Buffalo premium pet food line will accelerate. The Cheerios maker has become a rare bright spot in the struggling packaged-food industry in recent months. Earnings per share are now expected to rise as much as 1 percent, excluding currency swings and other items, General Mills said Wednesday. The company previously expected a decline of as much as 3 percent. Earnings in the fiscal third quarter, ended in February, also beat Wall Street estimates. The outlook signals that the integration of Blue Buffalo, bought in April 2018 for about $8 billion, is proceeding well. The pet food brand, which General Mills is expanding into mass-market retailers, is key to the company’s efforts to diversify away from packaged foods. The company has also made moves to expand in the organic and naturals (human) food market, with its acquisition of macaroni and cheese maker Annie’s in 2014. And it owns Cascadian Farms, which makes organic cereal and frozen vegetables. The acquisitions and innovations to help brands like Yoplait -- and its “simply better” line, which includes the French style Oui and less sweet YQ lines -- seem to be paying off. Wednesday’s results also show it’s been able to successfully push through some price increases, helping to boost margins. 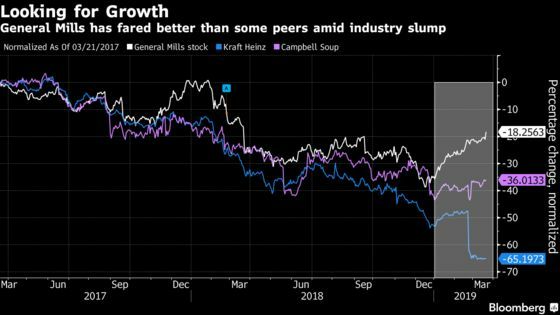 Although sales remain sluggish, General Mills is faring better amid changes in consumer habits than other packaged-food giants like Kraft Heinz Co.
Shares of General Mills jumped as much as 4.8 percent to $49.50, the highest since March 20, 2018. For more financial details on the quarterly results, click here. For company statement, click here.